required three and one-half ten-inch sides, reading from an 1800 word script. In both recordings of "Coalsack" and "Stroke", music was played through a small speaker that was held up to the recording mike. Results were good, but not as satisfactory as they were on our third and latest attempt. In this case, music was fed directly through Dollens' new amplifier to the cutting needle. Reproduction was near-perfect. The story was "The After-Life", an odd bit of fantasy, and the only bit we know of to emerge from Saari's typewriter. Strains from "In a Mountain Pass" and excellent reading by Russell and Blakely combined to make this the best attempt to date. The clearness of the final product is hard to believe. As for the future, the dramatic recording idea will no doubt remain one of the greater objectives of the MFS, barring, of course, the loss of Dollens via draft, which seems to be just over the horizon. Without Morris the idea would never have come to light; thus the society is greatly indebted to him for his iniative along such libes. We hope to make an attempt at Carl Jacobi's recent Weird Tale story, "The Phantom Pistol", which Carl has already prepared in script form. Proper handling of such a yarn as this could result in a very gripping play. If it should reach any of our expectations, undoubtedly there would be re-makes for distribution, which also has been one of this society's aims. Not all recordings are dramatic. 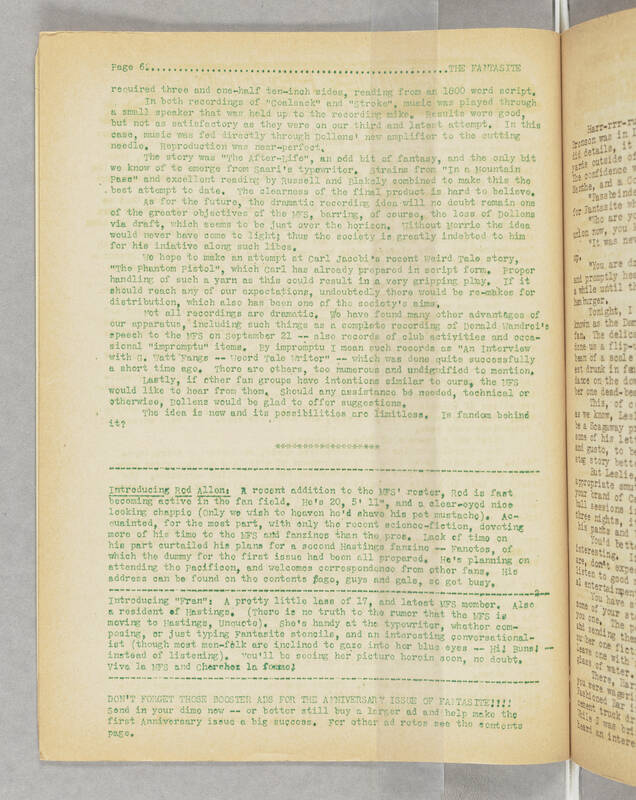 We have found many other advantages of our apparatus, including such things as a complete recording of Donald Wandrei's speech to the MFS on September 21 -- also records of club activities and occasional "impromptu" items. By impromptu I mean such records as "An Interview with G. Watt Fangs -- Weird Tale Writer" -- which was done quite successfully a short time ago. There are others, too numerous and undignified to mention. Lastly, if other fan groups have intentions similar to ours, the MFS would like to hear from them. Should any assistance be needed, technical or otherwise, Dollens would be glad to offer suggestions. The idea is new and its possibilities are limitless. Is fandom behind it? ************************************* ------------------------------------------------ Introducing Red Allen: A recent edition to the MFS' roster, Red is fast becoming active in the fan field. He's 20, 5' 11", and a clear-eyed nice looking chappie (Only we wish to heaven he'd shave his pet mustache). Acquainted, for the most part, with only the recent science-fiction, devoting more of his time to the MFS and fanzines than the pros. Lack of time on his part curtailed his plans for a second Hastings fanzine --Fanotes, of which the dummy for the first issue had been all prepared. He's planning on attending the Pacificon, and welcomes correspondence from other fans. His address can be found on the contents page, guys and gals, so get busy. ------------------------------------------------ Introducing "Fran": A pretty little lass of 17, and latest MFS member. Also a resident of Hastings. (There is no truth to the rumor that MFS is moving to Hastings, Unquote). She's handy at the typewriter, whether composing, or just typing Fantasite stencils, and an interesting conversationalist (though most men-folk are inclined to gaze into her blue eyes --Hi! Buns! -- instead of listening). You'll be seeing her picture herein soon, no doubt. Viva la MFS and Cherchez la femme! ------------------------------------------------- DON'T FORGET THOSE BOOSTER ADS FOR THE ANNIVERSARY ISSUE OF FANTASITE!!!! Send in your dime now -- or better still buy a larger ad and help make the first Anniversary issue a big success. For other ad rates see the contents page.